Overview - Hard-drinking, burnt-out ex-CIA operative John Creasy (Denzel Washington) has given up on life--until his friend Rayburn (Oscar winner Christopher Walken) gets him a job as a bodyguard to nine-year-old Pita Ramos (Dakota Fanning). Bit by bit, Creasy begins to reclaim his soul, but when Pita is kidnapped, Creasy unleashes a firestorm of apocalyptic vengeance against everyone responsible. Director Tony Scott ('Crimson Tide,' 'Déjà vu') has taken a lot of hits for the kinetic style he's developed over the course of his career. In contrast to his brother Ridley’s techniques, Tony employs shaky camerawork, quick editing, and grim violence to unsettle his audience. More importantly, he's developed the ability to combine raw emotion with his visceral style to create something truly unique -- an experience that effectively transports his audience into the turbulent worlds of his films. 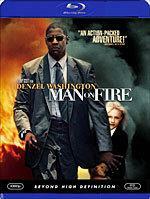 'Man on Fire' tells the story of John Creasy (Denzel Washington), a troubled ex-CIA agent, who's hired by a wealthy Mexican businessman (Marc Anthony) to protect his daughter (Dakota Fanning) and wife (Radha Mitchell). 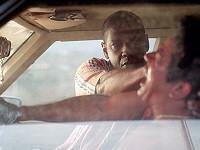 But when a kidnapping and ransom attempt involving a family member goes awry, Creasy sets his mind to exacting revenge. With the help of his old friend Paul Rayburn (Christopher Walken), Creasy begins to shoot his way up the criminal ladder to punish everyone involved the botched plot. 'Man on Fire' can be truly tough to watch at times. It's easy to root for Creasy's personal mission, but it can be difficult to stomach his violent methods. Scott doesn't simply create a cookie cutter hero worth cheering for, he establishes an imperfect man who must tap into long-suppressed demons to achieve his goals. He's no ordinary hero, and this is no ordinary story -- it's a revenge tale, one that never pauses for the moments of comic relief inherent in similarly themed films like 'The Punisher'. Despite the film’s grim tone, the results are a refreshing change from other revenge fantasies that so often seem to excuse the extreme behavior of their protagonists. Under Scott’s direction, Denzel Washington’s performance exudes the character's humanity and inner conflict. There isn't a black and white scene in the film . Everything comes steeped in the questionable gray areas of the real world. Most impressively, Scott never resorts to cheap sentimentality or conventional plot developments. This is particularly evident during a key scene late in the film when Creasy hits rock bottom. In that moment, the character truly registers as a real person coming apart at the seams. Moments later, he undergoes a revelation that allows him to claw his way out of the darkness and redeem the violent acts that have consumed his life. Not to over-allegorize, but Scott transforms Creasy into a perfectly rendered Christ-allusion that rises from the mud to do something pure and good for the innocent. As for Scott's oft-criticized visual style, personally I loved every frame of 'Man on Fire.' The film's stark colors, jittery camerawork, and involving subtitles are meticulously designed to evoke very specific reactions from the audience. Chaos plays out in unsteady camerawork, with the violence shown in high-contrast daylight for a reason -- Scott wants to be sure viewers see and hear every ounce of pain that Creasy feels and inflicts. Granted, not everyone will enjoy this aesthetic, but fans of the director’s other films -- as well those impressed by the work of filmmakers with similar styles, such as Paul Greengrass (‘United 93,’ ‘The Bourne Ultimatum’) -- will find these techniques equally effective and engaging. While many critics don't share my appreciation of the film -- Rotten Tomatoes reports an abysmal 39% positive rating among critics (mainly due to the film's visuals and violence) – don’t let that dissuade you from checking this one out. 'Man on Fire' continually breaks convention and delivers a heart-wrenching revenge tale. The performances are exceptional, the direction is sure-handed, and the story and its characters are fascinating. 'Man on Fire' is presented with a faithful 1080p/AVC MPEG-4 transfer that perfectly replicates Scott's visuals. Colors are rich and lush -- the palette may seem oversaturated at times, but it never wavers or appears unstable. Black levels are incredibly deep, whites aren’t subject to blooming, and contrast is steady. Better still, detail is sharp and natural -- skin texture, clothing fibers, and stubble look crisp and three dimensional. Just take one look at the scene in the daughter’s bedroom. Notice the book titles in the background, the stitching on the bed linens, and the trinkets at her bedside -- every detail pops out, making this one of the most accurate presentations I've seen. The print is in great shape as well. Grain is certainly a factor in the film’s imagery, but it only fluctuates when the director intends to make violent scenes seem grittier than those of quiet conversation. The transfer itself doesn't suffer from any major source noise, artifacting, or edge enhancement. If I have any complaint, it's that interior shadows and nighttime shots are sometimes crushed and unrevealing. Of course, this is a product of Scott's style as well, so it hardly counts as a significant criticism. 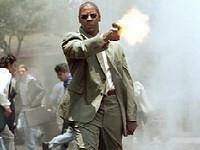 In the end, 'Man on Fire' looks amazing and blows away the standard DVD versions. It'll certainly wow fans of the film and catch the eye of any newcomer sampling it for the first time. 'Man on Fire' features an aggressive DTS HD 5.1 Master Lossless Audio surround track that does a great job reproducing both the roar of pandemonium and the subtleties of a whisper. While the film’s first act offers mostly quiet ambiance and crisp conversations, chaos quickly moves in to dominate the soundfield, making dynamics the star of the show. Commanding LFE rumbles mingle with balanced treble tones to produce a natural and powerful soundfield. When I felt the impact of gunshots or explosions in the center of my chest, I knew this track was out for blood. Moreover, I was impressed with the number of individual elements present in the rear speakers -- the sound designers managed to hurl immersive acoustics and explosive sounds across the back of my home theater throughout the film. This mix does suffer from one fundamental issue. While both the quiet scenes and the action set pieces sound amazing, every now and then the action beats are overwhelming. I found myself adjusting the volume on four occasions when a conversation would suddenly erupt with gunfire or heavy music. Jump to the scene where Creasy ambushes the caravan with a rocket launcher. Notice the disparity between the volume levels? As soon as the explosions started, I had to lower the volume to a more comfortable level. I would have preferred a bit more balance. Aside from that lone issue, the film's natural soundscape and stirring dynamics continually made me forget that I was watching a movie. This is a massive disappointment for fans of the film, and one that leads me to believe we'll be seeing another high definition edition of 'Man on Fire' in the future. When will studios learn these lazy maneuvers only serve to alienate fans and reduce the value of an otherwise exceptional disc? 'Man on Fire' is a remarkable film and a technical powerhouse on Blu-ray, featuring a striking video transfer and a potent DTS HD MA audio track. This release would be highly recommended if it included the special features from the standard and Collector's Edition DVDs. Studios need to wise up and realize many of their fans are already double dipping when they buy a high definition catalog release. A barebones disc like this one only causes fans to brace themselves for an additional dip in the future.